Switchboards are important vital pieces of industrial and commercial technology that no-one notice unless something goes wrong. Only then do owners appreciate just how dependent they are on the rugged reliability of this electrical distribution technology to feed current to vital functions such as computing, banking, data processing, manufacturing, industrial processing, lighting, lifts and emergency services – in fact, everything electrical in a building. “K.E. Brown Electrical Switchboards takes them so much for granted that few people understand what can happen if switchboard manufacturers do not test their technology rigorously to ensure they can withstand major power faults,” says Sean Peacock for electrical engineering company K.E. Brown Electrical Switchboards. K.E. Brown Electrical Switchboards provides custom-engineered low-voltage switchboards to many companies as diverse as BHP Billiton and IBM; ABN Amro and Bovis Lend Lease; CSR and AMP; Sydney Water and Woolworths; Alcatel and EDS; Leighton Contractors and Lucent Technologies; McDonalds and Optus Vision; and also to hospitals, hotels, telecoms and banks. Because such clients demand the high standards of reliability to safeguard their operations, K.E. Brown Electrical Switchboards recently instituted its own programme of research and development testing that went far beyond the mandatory and usual requirements and surprised itself with the results. “We wanted to go a step further by testing a whole new generation of our switchboard technology. We also wanted to test new switchboard materials, such as Fibon glass polymer fibre busbar supports and Cu-Flex braided conductors. 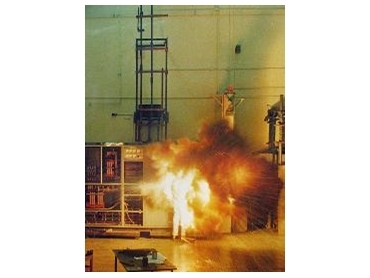 Testing was conducted at the Sydney facilities of Testing and Certification Australia, where switchboards can be tested to the point of destruction and beyond. The switchboard selected for this rigorous treatment was a 2000A rated type, which, in addition to withstanding sudden overload, was subjected to testing for temperature rise that could cause long-term damage and result in unreliable and unsafe performance. “We wanted to see how far we could go beyond the standard 63 kA for one second, so we could demonstrate safety, robustness and ability to handle any fault conditions predictable on any site. “When we got up to 63 kA nothing was happening, so we turned it up some more. At 80, still no problems. We just kept winding it up until we were at 100, when we decided that discretion was the better part of valour – we had well and truly proved what we set out to do. “Not only did the switchboard as a unit stand up to this type of abuse – far more than it could expect in normal service, but also the new materials survived a real baptism of fire. “The Fibon material, which is used to replace Permali wood as bus bar supports, was good. It was untroubled at levels of 63 and 80 kA and we could have gone past 100 if we had wanted to. “This demonstrates a double benefit for the customer, we can use less bus bar supports made from Fibon as from Permali, permitting greater cost efficiencies in production. “The Cu-Flex material, from NHP, also performed well, handling everything we could throw at it and coming up every bit as good as the solid copper alternatives usually employed in connections coming off the bus bar. “Again, the customer benefits of this are high margins of safety combined with lower cost of production. Cost savings without quality are of no interest to us, but it is a different matter where we can get advances in technologies that are also cost-efficient. “We are delighted with the results of this testing research and development, because it has proven to be ideal on many fronts: safety, cost-efficiency, reliability and ruggedness of construction. “While the R&D exercise cost us money and time and we did not have to do it – the dividend is absolute confidence in the technology involved and demonstrated performance of the new materials employed. We feel we have gained a double dividend,” says Sean Peacock.